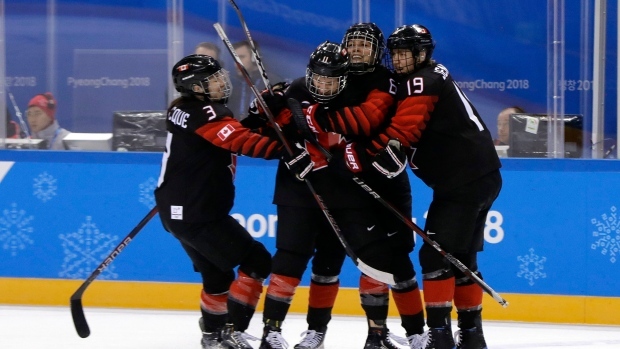 PYEONGCHANG, Korea, Republic Of — Melodie Daoust and Meghan Agosta each had a goal and an assist to help Canada down Finland 4-1 in Olympic women's hockey play Tuesday. Marie-Philip Poulin and Jillian Saulnier also scored for Canada as some of the Canadian men's team watched from the upper tier of the arena. Riikka Valila, Finland's 44-year-old veteran, scored at 7:17 of the third, stuffing in her own rebound off an athletic Shannon Szabados save following a Canadian defensive letdown. Szabados then stopped Susanna Tapani on a breakaway. Poulin's goal, which made it 2-0 at 17:11 of the first, needed a video review for confirmation after the referee waved it off. After Jenni Hiirikoski lost the puck in front of goal, Poulin roofed a backhand that came out as fast as it went in. The review came at the next break in play. Canada's record against the Finns at the world championships and Olympics now stands at 27-1-0 (6-0-0 at the Olympics). The Finns won bronze at 2017 IIHF women's world championship in Plymouth, Mich., where they upset Canada 4-3 in the preliminary round with Raty making 35 saves. Canada struck early Tuesday with Daoust intercepting a Finnish clearance for a 2-on-1 opportunity. Daoust deftly delayed her pass to freeze the goalie and then slipped the puck between the defenceman's legs to Agosta for a tap-in goal just 35 seconds in.